As a trainer certified by the American Council on Exercise, I focus mostly on strength training. I find a world of difference between my active older clients and those new to the exercise world. Most often the inexperienced are there for the first time due to doctor’s orders and/or illness. Some are downright frightened. But chances are, if they have been living an active lifestyle in the broad sense, they’re doing OK. Moving with little effort in our younger years is so often a given, it’s hard to imagine life’s limitations brought about as we age. But these limitations don’t have to be so drastic. Yes, keeping an active lifestyle through the years requires effort. Obvious, basic, but really can’t be stressed enough. Allow me to share a personal story that really brought it home for me. My 88-year-old mother has been active her whole life, a different kind of active in the days of one-car families and manual everything. Although she hadn’t stepped foot in a gym until she began working with a trainer in her 70’s, she has continued both personal sessions as well as classes at her retirement community. She recently took a spill and twisted her ankle and broke her wrist. Her first broken bone in 88 years! Sure, she had limitations for weeks. But I was amazed how the core strength she developed over the years allowed her to scoot out of her chair while so hindered with that bum ankle and wrist. A-MAZED. In less than 2 months she was back to her active self, working at the community’s store and calling Bingo for the “old folks” in assisted living. Go mom! A lifetime of fitness, like anything that’s worth it, starts early and takes tweaking. I’m so glad to see younger generations understand the value of fitness beyond sculpted abs and smaller sizes (although there’s nothing wrong that). Unfortunately, so many in my mother’s generation thought of it as vain and selfish, something that took you away from family duties and obligations. 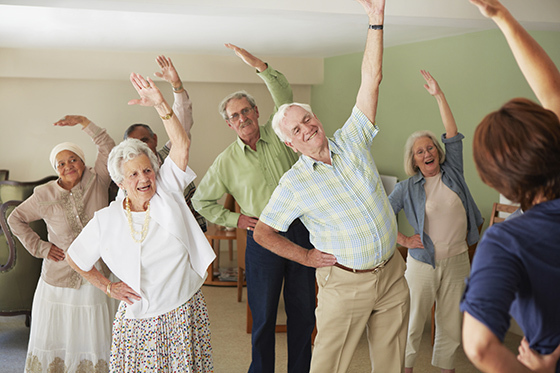 Today’s seniors are aware of the fun to be had by keeping fit. Whether it’s keeping up with their children and grandchildren, going on vacations, or walking long stretches of beach or airport terminals – it’s the stuff of life. And at the Pilates and barre studio where I work, our reformer sessions are just as much social circles as they are strength training for all ages. Anyone can join a class with a quick adjustment of the resistance springs. Nothing better than several generations working out together and sharing stories. And that, my friends, is what being active is all about. A habit that requires work, yes, but one that allows you to scoot off that chair and go join the young and the young-at-heart. Guest blogger Linda Jennings holds her Personal Trainer Certification with the American Council on Exercise (ACE) and Reformer I training with Stamina Pilates. Her hobbies include running (participant in Broad Street Run and Philly Distance Half Marathon), hiking, traveling with her husband, and reading. Great eye-opener on the importance of fitness as we grow older. That’s exactly what makes the difference between aging well and aging poorly – staying active. Research has shown that sedentary lifestyle is the number one way to lose your health. Bar none.